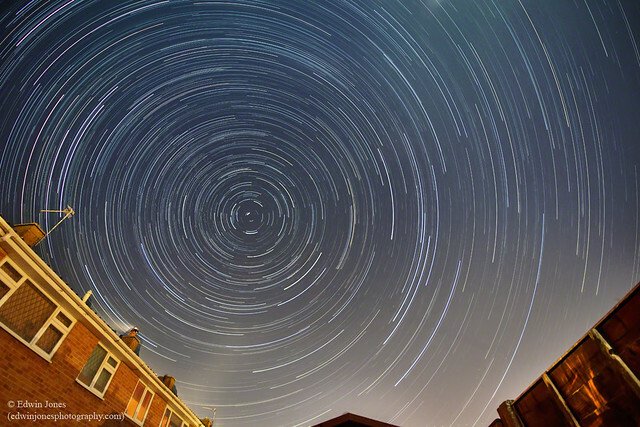 Urban Star Trails West Sussex | Flickr - Photo Sharing! This shot was taken on a really clear evening last Sunday 25 February. Never let anybody convince you that it is only possible to take decent star trail images many miles away from any light pollution. This was taken in my back garden in a medium sized town though it is on the edge of town. As long as there is no street light directly in the field of view the Camera can see and record stars. Also I found with this shot that star trails can be recorded when the moon is up, in this case ¾ full and behind the camera. I think the bluer tinge to the image and less yellows from light pollution was due to the moonlight. This was 2 ½ hours worth of 2 minute shots so 75 images. These were later combined in Startrails.exe. The process removes Exif. The settings set up on the timer remote were 1 minute 59 seconds with a 1 second interval between shots. The number of shots was set at 80 to allow time for some dark frames (shots with the same settings with the lens cap on to remove noise). The camera was set to manual at 5.6 aperture, shutter speed was set at bulb and ISO 320. I knew where the North Star was from previous shots but would otherwise use the Google Sky Map App. is very important to turn off all long exposure and high ISO noise reduction to avoid increasing the gap between exposures. The Timer Remote is just £12.99 from Neewer on Amazon. I used a Sony A68 with a Sigma 10-20 lens at 10m. I also strapped chemical handwarmers to the lens. This avoids the ever present risk of condensation forming on the lens as it cools and spoiling the shot. For post processing the most time was taken in removing airplane trails. The simplest way to do this is on the original individual images using the heal tool in Photoshop to draw them out but it was time consuming. Being 40 miles from London Gatwick about 20 of the images needed attention. StarTrails.exe is free from www.startrails.de/html/software.html and automatically does the blending using jpegs. The latest version has a new feature which cuts out the small gaps between each image as the camera triggers the shutter. More of the trails were brought out with Topaz Clarity and then Topaz DeNoise was used. Some small colour adjustments were made using a Vibrance layer and a layer mask to exclude the foreground. Nillllll, Steve Millward, Räi, and 57 other people added this photo to their favorites. Nicely captured! Beautiful colours and composition! This is simply awesome !! Great capture & narrative. Love the explanations you give with your uploads. Great shot - must try this some time. Very well done. And thank you for the post processing details. Wow, what a shot! Amazing what you had to do to get this finished image, Edwin. I am going to get one of those timer remotes and give this a try. Thanks for the inspiration and the helpful tips on how to do this...and congrats on this amazing image! Nice one, I always enjoy seeing urban star trails. There are so many approaches to star trails as technology changes in the camera. Beautiful approach and great shot Edwin. I like you said I can do close to a town if light is right angle. - this makes it more plausible than being out in strange countryside alone at night.